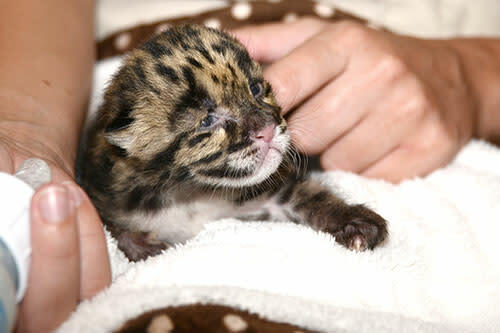 An endangered clouded leopard gave birth to a single male kitten on March 7 at Tampa’s Lowry Park Zoo. As the first kitten born to the Zoo’s pair of 4-year-old clouded leopards, this offspring introduces new genetics into the managed population in North America. The parent leopards, “Yim” (male) and “Malee“ (female), arrived at the Zoo in 2011 at six months of age. They were paired as potential mates by the Clouded Leopard Species Survival Plan (SSP), a program of the Association of Zoos and Aquariums (AZA) designed to support the conservation of select wildlife species at risk of extinction. 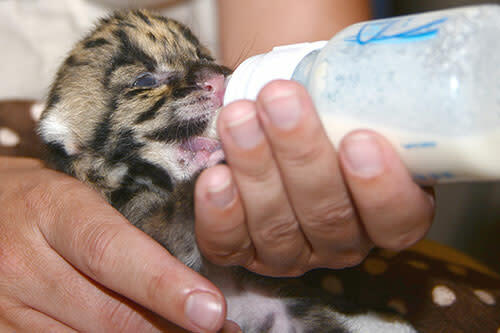 With this birth, there are a total of 87 clouded leopards in 22 AZA-accredited institutions. Zoo animal care staff were on watch for the birth following breeding and gestation estimates of approximately three months. 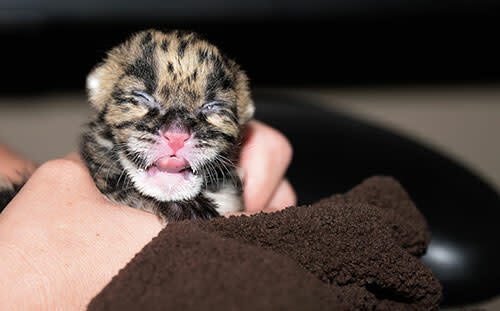 Shortly after birth, the Zoo’s animal care team observed the kitten to be a male, and are now providing round-the-clock care. Per species protocol, clouded leopard kittens are hand-reared to facilitate introductions to potential mates at six months of age, as with Yim and Malee. Within the AZA managed population, hand-rearing kittens for socialization and introducing to potential mates at a young age has been very successful in reducing fatal attacks by aggressive adult males. The kitten is feeding well and gaining weight, born at 300 grams and weighing in at 565 grams on day 10. He has just begun to open his eyes and will be strong enough to walk in the next few weeks. He will be hand-reared until weaned at about 3 months of age. At that time the AZA SSP will make a determination about his future home. Clouded leopards are the smallest of the “big cats,” weighing 30- 50 pounds in adulthood and measuring about five feet long (including the long tail). Native to Southeast Asia, clouded leopards are found in forests and rainforests. They are known as shy and reclusive cats. As a forest-dependent species, the leopard’s native range is undergoing the world&apos;s fastest regional deforestation rates. High levels of hunting and poaching also make the species vulnerable to extinction. 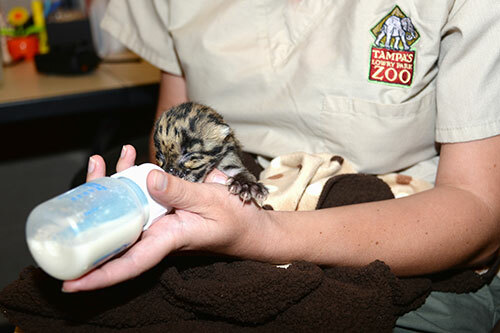 Tampa’s Lowry Park Zoo has been a member of the clouded leopard SSP for more than a decade. The Zoo has also supported a conservation research program known as WildAid -- the Thailand Carnivore Project, a non-invasive study of Thailand’s wild cats including the clouded leopard.